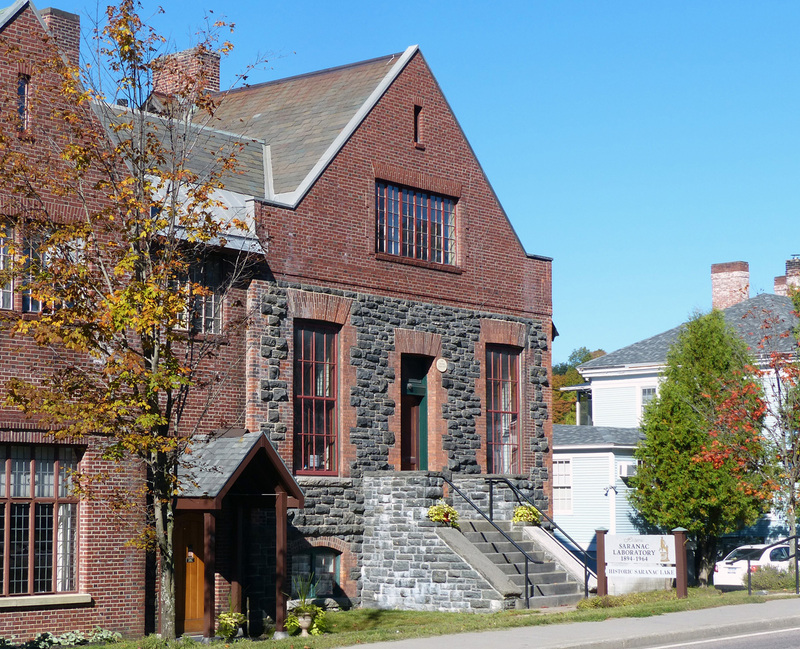 Searching for the cure in Saranac Lake – microBEnet: the microbiology of the Built Environment network. Sept. 18, 2013. Magill House – I’m in a B&B that was once a cure cottage in the Adirondack town of Saranac Lake, New York, where for more than 70 years tuberculosis patients came from the big city hoping that the cold mountain air would cure their disease. 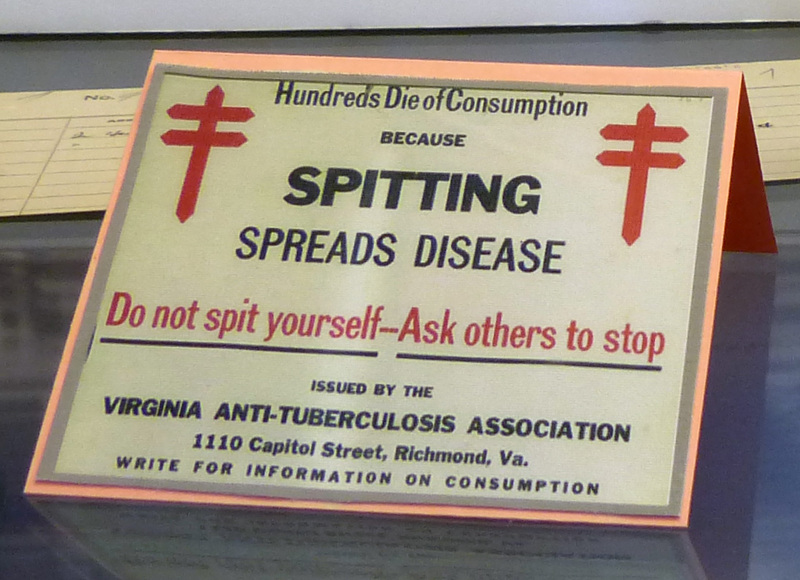 Half the houses had TB patients near the end of the First World War. Those who ran the cure cottages and sanitoria for the wealthy consumptives understood Pasteur’s germ theory. Thorough washing of dishes, cutlery, clothing and bedding were all part of the cure. Commercial laundries did good business; this B&B was originally built by a laundry magnate. When Robert Koch announced his discovery of the tuberculosis bacterium in 1882, he claimed that one in seven Germans died of what was sometimes called the White Plague. To isolate the bacterium, Koch switched from gelatine, which liquified at body temperature, to solid media such as potato slices or eventually agar, and then waited for up to three weeks to observe visible growth of what became known as Mycobacterium tuberculosis. Today, a microbe requiring such innovation to cultivate might be dismissed as unculturable. His discovery was his first demonstration of the now famous Koch’s Postulates, which he devised in his earlier studies of anthrax. He isolated the protein tuberculin from his cultures, and studied it’s potential as either a vaccine or cure. This was the origin of the skin scratch test that many of us received as children to determine if we had been exposed to TB. Christmas Seals, supplementary stamps with a double red cross, were attached to envelopes as a reminder of the diseases. Saranac Lake gets most of its tourist dollars from hunters and fishermen, and the reflected glory of the two Winter Olympics held at nearby Lake Placid. But the ghosts of TB are here. Most of the former cure cottages and sanitoria were repurposed, but thanks to the efforts of local historians, their medical histories are known. The microbiological pilgrim can track them down, as I did when I booked this B&B, originally one of the more expensive, private, ‘boarding’ cure houses. I don’t have much paranoia about lingering cells of the mycobacterium puffing up in dusty aerosols when I roll over in the night. There is no balcony on our room, but the front of the house has a huge porch where the patients spent their silent, stationary afternoons. They reclined side by side in long rows of ‘cure chairs’, willing scar tissue to encase the bacterial nodules in their lungs and give them a chance at returning to normal life. Maybe we will have our breakfast there. I wonder why I bother to track down these figments of science past, these shadows of overused X-rays burned into the plaster behind the wallpaper? Perhaps I have an answer. Modern scientists have the worlds’ scientific literature at our finger tips and unbelievably fancy machines that produce more data in an hour than the human brain can process in a lifetime. Without all this, how many of us would have the persistence and creativity to understand and solve these problems using our own ingenuity? There are only a few main rooms in this rebuilt laboratory. The first is the main lab, with a high ceiling and tall windows along one wall. The walls are entirely brick, triple glazed to a white, glossy finish that could be easily disinfected. In the corner of the main room is a smaller lab that belonged to Edward Livingston Trudeau (the great-grandfather of the Doonesbury Trudeau), the founder of the laboratory, with microscopes, flasks, and other now antique instrumentation arranged how they might have been used in the days when experiments were done here. 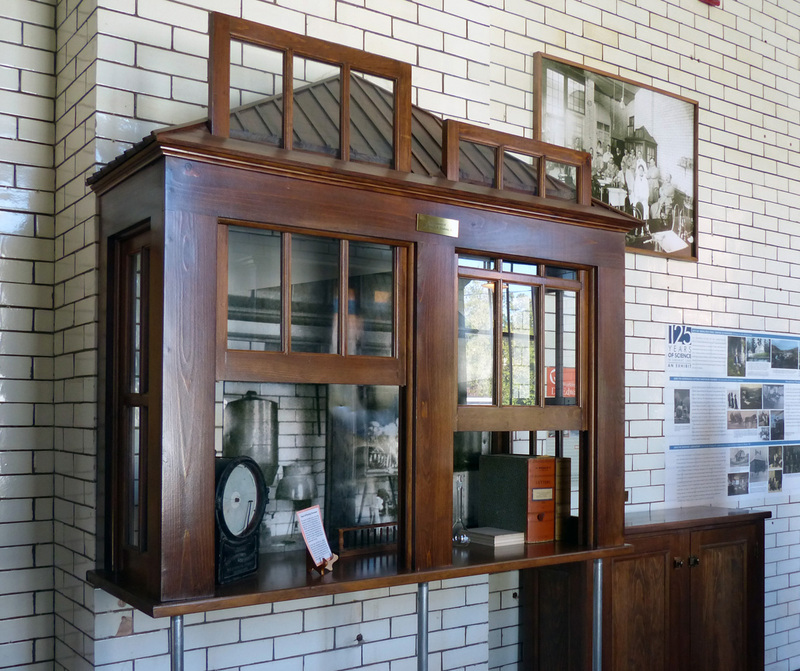 On the inner wall of the main room is a custom-built wooden cabinet with a peaked roof, a reconstruction based on a photograph of the original lab published in an 1897 issue of Scientific American. This is an early laminar flow hood. A vent pipe runs unseen out the back of the cabinet to one of the three chimneys emerging from the peak of the building. The large windows on the opposite outer wall were kept open, even in the winter, to establish air flow through the hood. 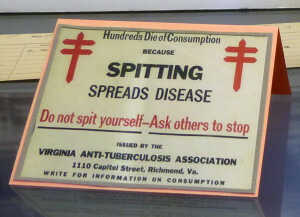 Everyone who worked in the lab had TB themselves, including Dr. Trudeau and colleague Dr. Edward R. Baldwin (who self-diagnosed his own infection by methylene blue and Bismarck’s brown staining of bacteria in his own sputum), and all of the assistants. Opening the windows reduced inoculum inside the building, and provided drafts allowing the passive laminar flow hood to be used for handling bacterial cultures. 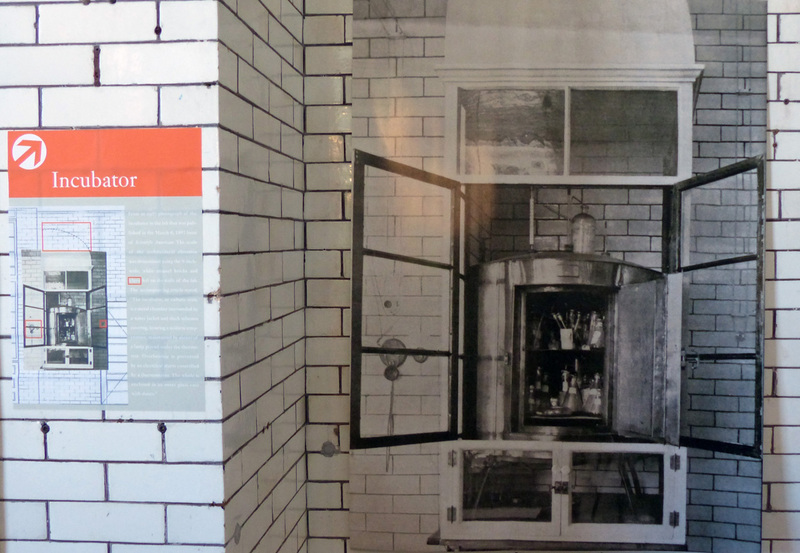 On the wall beside the main door is another photograph from Scientific American, enlarged to life size, of a cupboard stuffed with test tubes and flasks stoppered with cotton plugs. 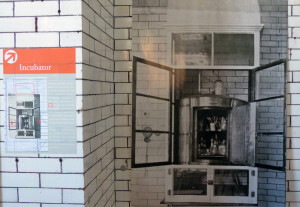 This was the 37°C incubator, which the museum has not yet managed to replicate. Trudeau originally had a small lab at his house next door (where he also had a private cure porch) where he fabricated an incubator himself to keep his cultures at the right temperature. It worked well but he thought a commercial heater would maintain a more constant temperature. He bought one at a local hardware store and it promptly burned his lab down, a catastrophe that eventually led to the construction of the custom built lab that is now the museum, financed by a grateful client and patron. Off the main lab was a surgery where the doctors treated and dissected experimental animals. Now, there is a curvy cure chair, similar in outline to a sun lounger, and a cabinet of artifacts such as an X-ray tube, and reminders exhorting people not to spit on the sidewalk (in case you ever wondered where our cultural taboo against spitting came from). In the basement is a narrow room that once housed a collection of preserved transverse sections of tubercular lungs, arrayed in rows and columns on parallel layers of sliding panels. There are only photographs of the collection now but one can imagine how macabre this might seem to the average tourist. Most scientists take for granted the hoarding of esoteric specimens, of great value for research, but saving slices of diseased lungs would seem far beyond the boundaries of socially acceptable collecting behaviour. To return to yesterday’s speculation of whether I could have made any progress on the problem of TB myself given the resources at hand, I must be honest. The primitive laminar flow hood and the not yet rebuilt turn of the century replacement incubator would certainly defeat me, although perhaps not my technician. Incubators at 37°C and flow hoods with HEPA filters are things I take for granted and rarely think about. Add flow cytometers, real time PCR machines, automated DNA sequencers and I must consider whether I might be part of a generation of spoiled scientists, immersed in a tsunami of technology and data, unaware that I might be drowning, my treasured ingenuity an illusion. For awhile, we discuss the social dimensions of this historic disease with our friendly host, which is her real interest, and from a different angle, also my own. The World Health Organization estimates that two billion people now carry latent TB, with significant co-infection with HIV. Multidrug resistant TB is a growing concern. A century ago, the rich and the poor flocked to Saranac Lake, with up to 20 trains per day discharging human cargo on the platforms of the station. The consumptive passengers entered a town where their affliction lacked the stigma that tainted their lives everywhere else. Almost everyone here had a relative or a friend with the disease. But discretely, the same trains returned to Lake Placid seven miles away, filled with camouflaged coffins of those for whom the cure had failed. 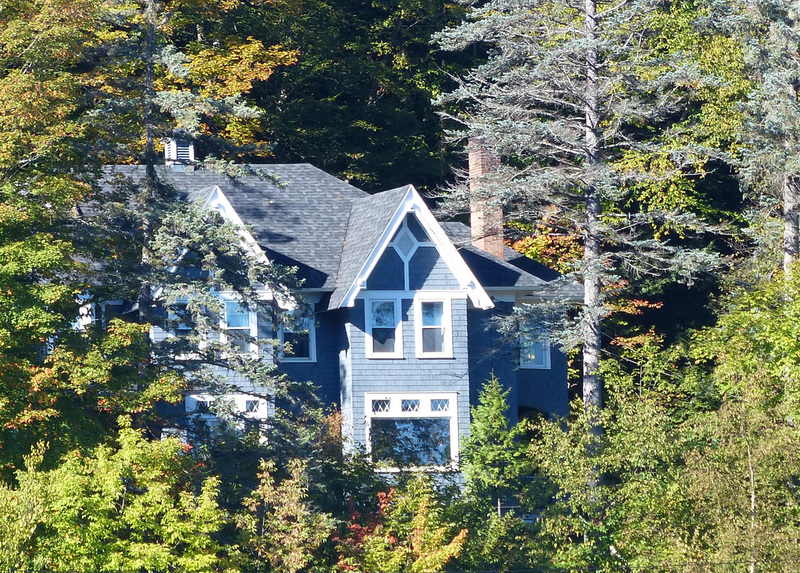 Postscript – There are several factual books about Saranac Lake and its cure cottages, including Phillip Gallos’ Cure Cottages of Saranac Lake. Wikipedia has a fairly complete list of still extant buildings that once filled this role. If you prefer the more human idiom of fiction, I recommend the elegant novel The Air We Breathe, and it’s short story prequel The Cure in the collection The Servants of the Map by the talented American writer Andrea Barrett. 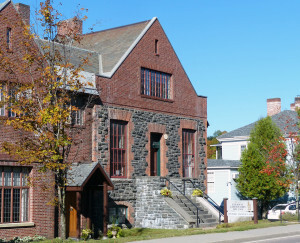 There are other destinations for the microbiologist pilgrim in the Adirondacks, including the modern day Trudeau Institute, and the former grounds of the Trudeau Sanitorium, now the property of a corporate management training group. For us, these destinations remain for a future visit.
.@phylogenomics our family has a house originally built as a cure home. Thanks for posting that!
. @jaytlennon @phylogenomics rent my house!